Having returned from death with the help of his step-brother Loki, Thor accepts Captain America's offer to join the new Avengers team, fighting alongside mutants to keep the world safe in the aftermath of the Phoenix Five. While some characters got drastically redesigned for Marvel NOW!, Thor wasn't one of them. His new costume was basically the same as what he was wearing before. The colors are darker, and his arms are bare, but it's not a major change. (If you don't want bare arms, he comes with a second, armored set.) 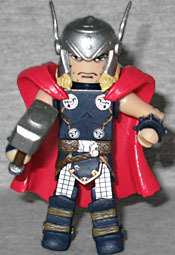 The cape and boots were pre-existing, but the waist cap and helmet are both new molds - and so is Mjolnir! He wears a pair of studded bracelets, to make sure his bare arms still look butch. Former boxer Carl "Crusher" Creel was given a magic potion by Loki, which gave him the ability to change his body into whatever material he touches. Although not a god, hands of rock and steel make him a worthy match for Thor! 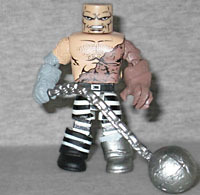 The very first Minimate Mini-Review we did was Absorbing Man, and now that I'm almost out of Minimates to review, here's only the second Absorbing Man ever! He's still wearing black and white striped pants, which is what he's seen in about half the time (the other half, of course, being purple pants). 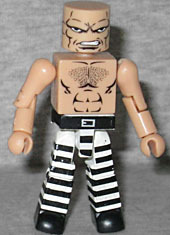 He's shirtless and has a scowl on his face, and you can really appreciate how different the standard Minimates art style has become since... good heavens, 2004. The detail is a lot finer and more intricate, aiming more for realism than stylization. Creel comes with his ball and chain - the one from the prison, not Titania. It's a new mold, which only makes us think how cool a four-pack of the Wrecking Crew would be. Since the normal figure is plain human, and that wouldn't be very interesting or show off his powers in any kind of interesting way, he comes with extra pieces to bulk him up - pantlegs, thigh caps, a powerhouse chest, a rocky right arm, and a jagged left arm that comes from Mokk (Grey Gargoyle) in the Fear Itself box set. That arm is painted brown (wood, maybe? ), the right arm is gray like concrete, and the left foot is metallic silver. Absorbing Man doesn't really use his powers that way in the comics, but every toy seems to favor the "multi materials" fashion, because it's a better way to convey the underlying idea. This set was part of TRU Series 18, and although it was one of the sets that didn't have the silver "exclusive" sticker on the front, it totally is one - this Thor and this Absorbing Man can only be had in this set. You're wrong, Absorbing Man does absorb more than one thing sometimes in the comics.